The rink has been marked as open until yesterday and then it was listed as "snow removal in progress" (with over 25 cm of snow). At 11 a.m. it was again listed as open. The first Friday night supper of the rink season. At 7.20 there were lots of staff, tables with odd tablecloths set up all over both rooms, and not much evidence of eaters. Hard to know where the skaters could fit. The cooks gave me a taste of the chicken and pea curry they had prepared. It was very good. But still the look of the room is more like a restaurant down on its luck than a rink with a snack bar. First time skate sharpening today since the rink opened (Dec.11). The staff say they've never seen the skates this dull. The rink has been crowded with skaters on many days -- and no one sharpening! Another amazing example of "nobody home." The last day of the two-week holiday was not too cold, and partly sunny. The rink was packed, and lots of people looked like they were enjoying themselves -- but more outside than inside. Inside was a problem. Half the room was cluttered with tables, positioned in such a way that they blocked people from getting to the benches to change their skates. The tables had various unmatched tablecloths of different sizes, and as the day wore on these were pulled crooked and stained with spilled hot chocolate. The viewing counter was blocked by more tables and rickety chairs. So people who wanted to sit at the counter to watch the skaters out the window couldn't really get there. As has now become the custom, only one of the double doors into the change room was open, so there was often a jam at the door. The garbage containers were close to overflowing but no one was changing the bags. The glass inserts in the front and back doors have partly ripped posters and old tape marks. Most of the lockers are still broken. The impression is one of a slightly out of control, cluttered and run-down storage room. 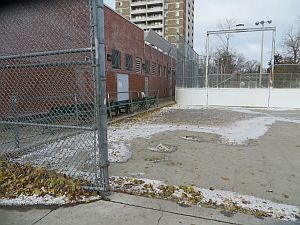 Tearing the rink clubhouse down and building it new won't help, though -- the newer, expensively redesigned change rooms at Christie Pits, Greenwood, Dieppe, Cedarvale, and Riverdale all lose their glamour within a few years and revert to looking like nobody loves them. These community places need mature, experienced on-site oversight. That's missing everywhere. 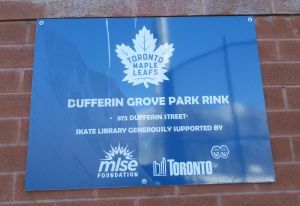 And in the case of Dufferin Rink, staff need to learn that this is first and foremost a rink, not a shabby restaurant. Lots of people have been coming to the rinks -- the lack of snow and mild temperatures mean that the ice is good and people are not shy about being out of doors. The scene in the rink clubhouse is very friendly, with lots of people having hot chocolate with marshmallows, or a bowl of Mary's chili, and catching up on the news with their neighbours. The counter stools are mostly too low, though, which makes it quite awkward to sit there. 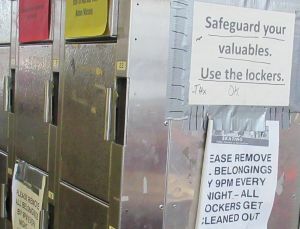 The Star's Fixer wrote a piece about the broken lockers at the city hall rink. It's no better here. Almost all the lockers are missing their coin-operated mechanisms. Only 8 still work. 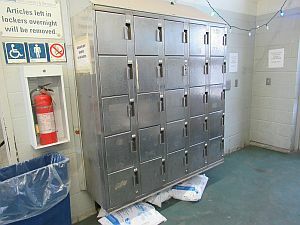 These are the lockers Tino got for the clubhouse 15 years ago, when it started to be so crowded, and thieves stole people's shoes and back packs. Somehow, this past summer all the locker mechanisms disappeared. Mysterious. Hopefully they can be found and fixed. People deserve to have somewhere to lock up their shoes. the sign says, use the lockers: but how? 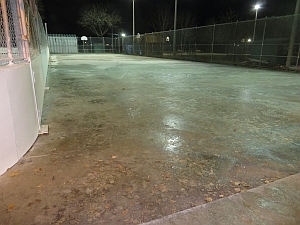 City staff worked to have the rink up and running as quickly as possible following the mechanical issues associated with the aging refrigeration system that staff encountered during their yearly start-up assessment. 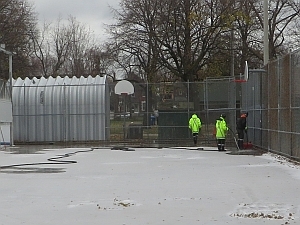 The City is also looking to replace the refrigeration plant entirely as part of a project focused on the northwest corner of the park<https://www.toronto.ca/city-government/planning-development/construction-new-facilities/dufferin-grove/>. I want to thank you for your patience as the City worked to resolve these issues and I look forward to seeing you in the park! 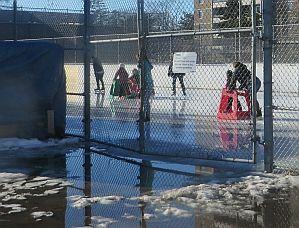 Although the rink had enough ice by Dec.9, it only opened for the season on Dec.11. At about 3.30 pm, the mechanics turned on the compressors, asking the rink staff "is that a sound you like?" Indeed it was. Five CIMCO workers were grouped around the end of the header trench, and then went back into the compressor room. Does this mean that more active work is being done? We'll see. 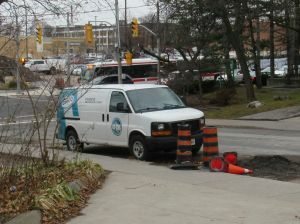 Dec.3: CIMCO truck seen at last! 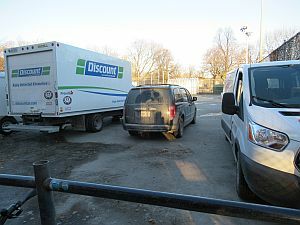 There were two CIMCO trucks at the rink at 11, then one left and the other stayed. Later on the news was that although the first problem -- whatever that was -- had been fixed, a new problem had arisen, involving a broken brine line. It sounds like that can't be fixed until the weekend -- why? Is it because CIMCO people are running all over the city trying to fix rink problems, so they have limited time to figure out the problem here? Or do they have to send to Chicago for parts? Nobody knows, because there is such a shroud of silence over all of this. A city workman who was coming out of the compressor room thought we should be able to open next week. He said they were waiting for another ammonium alarm. They said that the compressor needed a new condenser. 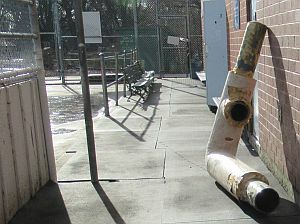 The man said the problem had to do with ammonia leaking into the brine that flows through the pipes. As far as he knew, that problem is fixed and the compressors could be started up now except for the missing ammonia alarm. He said the CIMCO guys were gone. There were two workers on the pleasure pad blowing off leaves. CIMCO workmen in the compressor room. At 1 pm the rec staff person was going through contact lists to inform school classes that their bookings at Dufferin Rink might not be possible and they should look at taking their classes to other rinks. But most other rinks don't have skate lending, which the schools rely on. 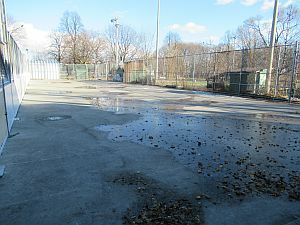 The rec staffer had not been told about Raymond Thomson's suggestion that the rink might be fixed by the end of the week, so that she might be sending out a false alarm. There were two city vehicles parked outside, and two city staff in the compressor room, but they were from Facilities and Real Estate (FRED), not tech services, and they said they were not there to fix any problem related to the rink being closed. By 9 pm there had been no word back from Raymond Thomson giving more information. But Peter Didiano, who works for Capital Projects, gave a little speech at the Community Resource Group meeting, about how the rink is pretty well on its last legs, just in time for being replaced by a new rink. He did not want to say what the current problems are, so we'll just have to continue asking. 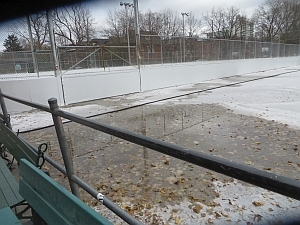 Sorry about the inconvenience that the delayed opening of Dufferin Grove Rink is causing. I just wanted to let you know that mechanics are on site today beginning to repair the refrigeration equipment. The mechanical issues were identified by third-party engineers during start-up preparations. City staff are working hard to efficiently finish the rink repairs, which should be completed by the end of the week. I'll know more information tomorrow. A city staff worker coming to inspect some element of the rink had not been told that the rink has no ice. So he went away again. "Is it conceivable that no one pre-checked the rink functions in October? And is it possible that CIMCO is only making their first assessment/repair visit tomorrow? Please let me know. Also, I would appreciate getting to talk to the tech supervisor before Wednesday when my park newsletter comes out and the capital projects community meeting takes place." If there were no problems noticed last year and the system hasn’t been started up this year, it must be the compressor that is the problem or some part of the compressor system. It’s really just a big fridge and somebody should be able to explain the magic or why the magic doesn’t work to regular people. 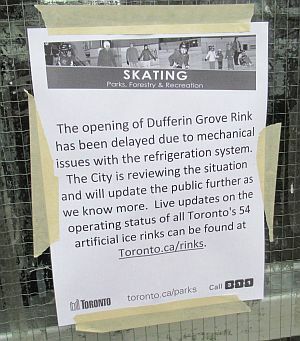 Dufferin Rink is now marked as "delayed opening" for "mechanical issues." Councillor Ana Bailao told me this afternoon that she had not heard back from staff about what's wrong with Dufferin Rink either. It sounds like now the prediction is that it will take a month to fix whatever the problem is. I see from the staff directory that you are Mr.Ubbens' project advisor. Could you arrange for me to meet with the tech rinks supervisor the next time he's coming to the rink anyway (sometime in the next few days, I assume) so that s/he could explain the mechanical problem, and I can write up an accurate account for the December park newsletter? It's a puzzle that until yesterday the city's website still claimed the rink would open on time. 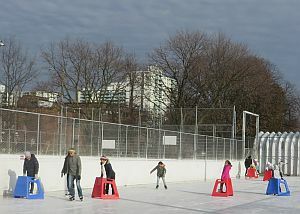 Thank you for reaching out regarding the delayed opening of Dufferin Grove Rink, which unfortunately was not able to open due to mechanical issues with the refrigeration system. We are in the process of assessing the full scope of the repair work and fully plan on making the repairs identified. 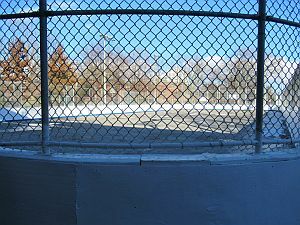 I will keep you up to date with the status of Dufferin Grove Rink as new information becomes available. From Matt Price: "I called Councillor Bailao's office and the person told me the reason the rink is not open is that it's not supposed to open until Saturday. I tried to explain that I was calling to say that the rink would not be able to open on Saturday because no ice had been made yet: but I don't think I made myself clear, because they just repeated that I shouldn't expect the rink to be open yet." The "opening delayed" message has now been changed back to opening Nov.24. That's in two days but there is still no ice being made. Staff says that no one has seen any repair trucks either. 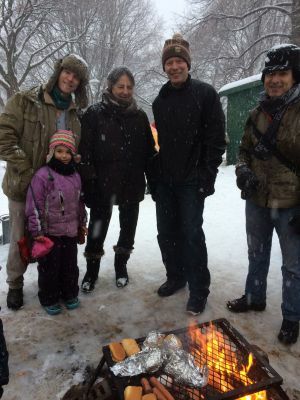 The 311 information service says all they know is that the rink is set to open on Saturday -- the day after tomorrow. The new supervisor of rink program staff was surprised to see no ice, and said she'll look into it. At 11 pm, there was no one making ice. The rink has no ice nor are the compressors running. Program staff have been told nothing. 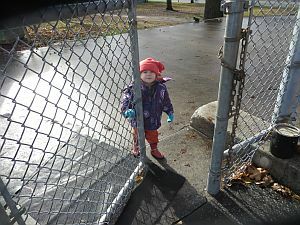 At 4 pm, the city's website changed the Dufferin Grove listing from Nov.24 to "opening delayed." In 2016, City Councillor Ana Bailao announced a project called the "Northwest Corner Revitalization." The community was to be consulted about the rink clubhouse -- should it stay the same, be renovated, or replaced with a new building? The budget for this was unknown. The city hired a consultant to do the community consultation, but after two meetings of a city-formed group called the "community resource group" (CRG), the project stalled. Then in April 2018, the project got going again, but this time with a budget of up to $4.5 million and an intention to rebuild the rink pad as well. The community resource group was summoned for its first return meeting on Oct.17,2018. The city's summary of that meeting is here. The CELOS summary is here. To test whether this rink needs to now be dug up and rebuilt, CELOS has assembled historical operating and maintenance material for Dufferin Rink here. On January 15, teacher Jessica Naves Gladman contacted CELOS because she had heard about our skate loan collection. She wrote: "I'd like to take my first graders on a skating trip. With the exception of one student, nobody owns skates. Are you able to help out?" The school is in Scarborough, but there are no rinks nearby with skate rentals. I suggested contacting Dufferin Rink to book a time, since they have skate rentals. Jessica booked Feb.27, but she was worried about getting her class there, over such a long distance. CELOS offered to pay for a school bus, and she said that would make the trip work. She also sent a letter to the Community Development and Recreation Committee of City Council, which was considering skate lending at city outdoor rinks. She wrote that the school where she teaches has the third highest rate of poverty in the city. 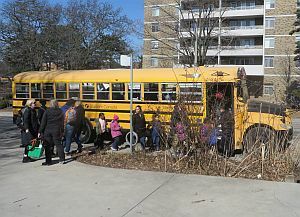 "It's of utmost importance to me that my students are afforded the same opportunities available to children who are growing up in more affluent neighbourhoods in Toronto. One opportunity that they miss out on due to their living conditions is skating. I began the process of trying to plan a class trip to a local skating rink and have been met with many obstacles standing in the way of getting them on the ice. One of these obstacles has been access to skates." the kids had practised balancing, and "falling the right way"
A few days before the class came, Jessica wrote: "The kids are so excited (nerv-cited, more accurately- excited to try skating, nervous that it will be hard!). I'm so glad to hear that DG has some skate aids. I won't tell them yet, but it's good for me to know that they exist." Today, when the class arrived, Jessica told us that the visit had some longer-term good consequences. When she put out the announcement that she was taking the whole class to Dufferin Rink, some skate donations came in. 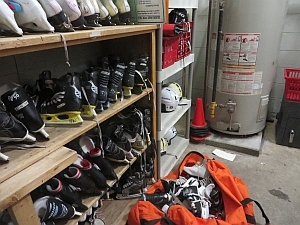 The phys ed teacher who came along said that as donations continue to trickle in, they hope to have enough skates to take the whole class skating again to an indoor rink near them. And the kids liked it so much that they said they all want to go again. 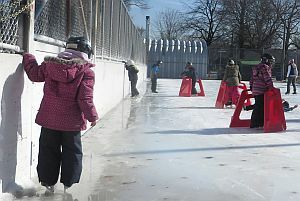 Dufferin Rink still gets lots of school classes, including during the couple of weeks every winter when the Queen Victoria School classes come. They ave a very interesting and ambitious skating program -- a link is here. Sounds like staff are being assigned to do a Caribbean-themed Family Day event at all three Ward 18 rinks (Dufferin, Wallace, Campbell) -- no posters yet. At 1 p.m. the rink has lots of kids playing shinny hockey on the hockey side. About half are without helmets. They look like they're having a good time. City staff were putting up "helmets mandatory for shinny hockey" signs at different rinks today. Should the kids be be ejected? Back to their screens? At 12.30 noon both rink pads are covered with water -- it's 11 celsius and the sun has melted the top layer. A few people are skating on the shinny hockey side, some more on the pleasure-skating side. The ice is still smooth under the protective layer of water, but it's obvious that the heavy metal frames of the nets are sinking into the ice. The staff person assigned to the skate room is sitting on a stool reading. When asked whether the staff plan to take the nets off the ice she says, no, they have not been directed to do so. At 4 p.m. the nets have been put up off the ice. 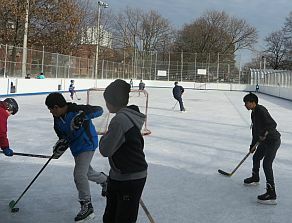 More than half of the city's outdoor rinks have been closed, but this one is still open. The layer of water is no longer enough to protect the ice -- gouges are starting to appear. At 8.45 p.m. there is not one skater on the ice! And only two non-staff in the building. The Women of Winter tourney was today, and the staff said that after they all left, there was no one. Nice temperature, nice ice, a Saturday night -- why? 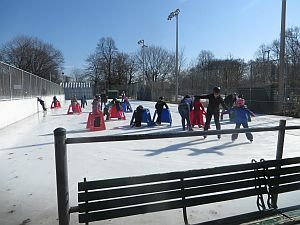 The rink opened at 9 a.m. and the first skates were rented out by 10.30 -- with I.D. despite management's concern that taking I.D. amounts to an "invasion of privacy." 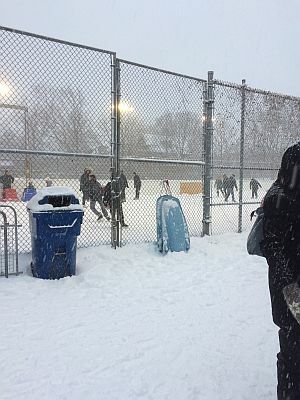 E-mail on the Dufferin Grove list: "I'm taking 3 Syrian kids skating tomorrow afternoon at the rink -- this will be their first winter activity ever, which is kind of cool. I was planning on renting skates for them at the rink but when I was there this afternoon there were VERY few pairs available, and I'm worried we won't be able to get on the ice!" It turns out there are 8 helmets, plus a few gloves and some tired-looking hockey sticks. The young kids' "try-out-shinny-hockey" program is no more. The staff have been told that there will be no hockey gloves or sticks to replace the many that disappeared last season. Some of the same staff who ran that program into the ground last years have been scheduled to work again this year. Three workers are cleaning off leaves with hot water. All three are wearing helmets, so the health and safety rules have gone to this level for the first time ever. The workers say that this year ice making will happen in the evenings, not in the daytime. The piles of leaves that were never removed at the other end of the rink seems to be mostly gone. However, all the leaves that got stuck on the pad when the compressors were turned on are still stuck there. Lots of remediation left to do, just because the leaves weren't blown off or raked up when it was the right time. In the evening there were no more rink workers, and no ice making either. The hot water from the attempts to get the leaves off had frozen into rough ice puddles but otherwise the rink showed no evidence of ice-making, and was still snow-covered in places from yesterday's small snowfall. In the rink house there was one staff person doing dishes. 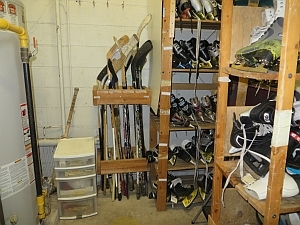 The skate lending room is tidy and ready to go, although the collection has started at the point where it left off last season, with many skates missing and only four helmets left (out of 40). The compressors are on and the skateboard equipment has been moved off the pad, but there are plenty of leaves in piles near enough to be carried right onto the rink pad -- where many are already frozen onto the cement. The hockey side of the rink is clean but the pleasure-skating side has lots of leaves. Both sides have equipment standing on them (bike polo nets, skateboard ramps). Compressors are not on.